Dark Empire provides intergalactic action for starving Star Wars fans! But then along came 1991. With three key new pieces of Star Wars media, the Dark Times got some light. Leading the charge was “Heir to the Empire” by Timothy Zahn, which kicked off the fan-favorite Thrawn Trilogy of novels. A few months later, an NES game from JVC and Lucasfilm Games provided the first Star Wars console title in North America since 1984. 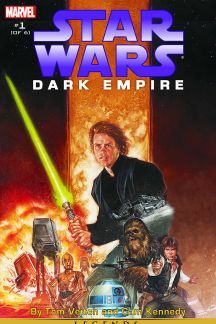 Finally, in December, Dark Horse released the classic STAR WARS: DARK EMPIRE #1, the first of hundreds of Star Wars comics it would continue to publish for more than 20 years to follow. 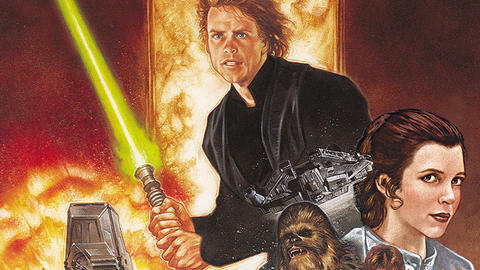 Drawn in by incredible cover art from Dave Dorman, fans were not let down with the new beautiful Star Wars content they had been craving for years. In just their first issue, writer Tom Veitch and artist Cam Kennedy dive head-first into the fan service: everything from the Millennium Falcon and Star Destroyers to Han shutting up C-3PO and a hint of Leia’s capabilities as a “Jedi Warrior.” We even see Luke take down an AT-AT using his powers alone, as well as the first-ever visual representation of Coruscant. But things get creepy when Luke indicates he must stay on the planet because he senses the dark side there. The issues to come will include Luke embracing the dark side of the Force to learn its secrets, a clone of Emperor Palpatine, and other significant events that blew fans’ minds in the early ‘90s.